The First United Methodist Church of Montclair started as a schoolhouse in 1827 in West Bloomfield (later called Montclair). Mr. James Wilde, who built the schoolhouse, donated a lot on Bloomfield Avenue, east of the Lackawanna Station where a church and parsonage were built. The church was completed in 1836. 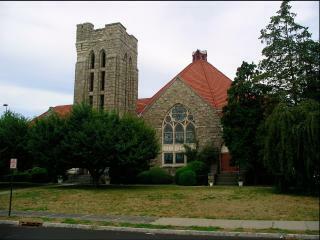 In 1879, the church moved to its present location. The current building on the site was completed in 1903. The building was designed by the firm of Van Vleck & Goldsmith in the Late Gothic Revival style. It is listed on the National and State Registers of Historic Places.